As early as the first century CE Indonesian vessels made trade voyages as far as Africa. Picture: a ship carved on Borobudur, circa 800 CE. The History of Indonesia or more precisely of the Indonesian archipelago in South East Asia with 17,508 islands goes back to Homo erectus (popularly known as the "Java Man"). There have been found fossilized remains of about one million years ago. Austronesian people, who form the majority of the modern population, came to South East Asia from Taiwan. They arrived in Indonesia around 2000 BCE. The native Melanesian peoples went to the far eastern regions. The agricultural conditions were very good. When wet-field rice cultivation was developed as early as the eighth century BCE, villages and towns developed. And small kingdoms began to flourish by the first century CE. Indonesia's sea-lane position helped international trade. There was trade with both Indian kingdoms and China already several centuries BCE. Trade has since fundamentally shaped Indonesian history. 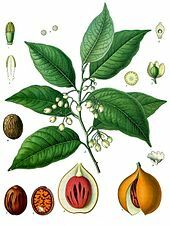 The nutmeg plant is native to Indonesia's Banda Islands. It is so valuable, that European colonial powers were attacted to Indonesia. From the seventh century CE, the powerful Srivijaya naval kingdom flourished as a result of trade. Hinduism and Buddhism were imported with it. In the late 13th century, the Hindu Majapahit kingdom was founded in eastern Java and under Gajah Mada, its influence stretched over much of Indonesia; this period is often referred to as a "Golden Age" in Indonesian history. During the 13th century Islam spread to the in northern Sumatra. More and more Indonesian areas gradually adopted Islam. By the end of the 16th century it was the dominant religion in Java and Sumatra. But it mixed with existing cultural and religious influences. The first Europeans arrived in Indonesia in 1512, when Portuguese traders, led by Francisco Serrão, sought to monopolize the sources of nutmeg, cloves, and cubeb pepper in Maluku. Dutch and British traders followed. In 1602 the Dutch established the Dutch East India Company (VOC) and became the dominant European power. But Dutch control stretched not very far. Only in the early 20th century it extended to borders of today. During the Second World War the Dutch lost control and in August 1945, Sukarno, an influential nationalist leader, declared independence and was appointed president. After some fights the Netherlands formally recognized Indonesian independence in December 1949 (with the exception of The Dutch territory of West New Guinea). Sukarno moved from democracy towards dictatorship. 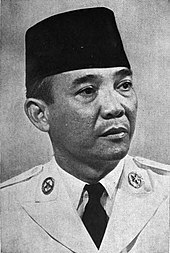 But Sukarono lost power to the head of the military, General Suharto who was formally appointed president in March 1968. He was supported by the US government, and encouraged foreign direct investment in Indonesia, which helped economic growth during the following thirty years. But his rule went along with corruption and suppression of political opposition. In 1997 and 1998, Indonesia was the country hardest hit by the Asian Financial Crisis. This increased popular discontent with the New Order and led to popular protests. Suharto resigned on 21 May 1998. In 1999, East Timor voted to leave the state of Indonesia, after a twenty-five-year military occupation. After Suharto's resignation democracy improved. A regional autonomy program was introduced, and the first direct presidential election took place in 2004. But some political and economic instability has remained. A political settlement to an armed separatist conflict in Aceh was achieved in 2005. ↑ Pope (1988). "Recent advances in far eastern paleoanthropology". Annual Review of Anthropology (Annual Review) 17: 43–77. cited in Whitten, T; Soeriaatmadja, R. E. and Suraya A. A. (1996). The Ecology of Java and Bali. Hong Kong: Periplus Editions Ltd. pp. 309–312. ; Pope, G (August 15, 1983). "Evidence on the Age of the Asian Hominidae". Proceedings of the National Academy of Sciences of the United States of America (National Academy of Sciences) 80 (16): 4,988–4992. http://www.pnas.org/cgi/content/abstract/80/16/4988. cited in Whitten, T; Soeriaatmadja, R. E. and Suraya A. A. (1996). The Ecology of Java and Bali. Hong Kong: Periplus Editions Ltd. p. 309. ; de Vos, J.P. (9 December 1994). "Dating hominid sites in Indonesia" (PDF). Science Magazine (The American Association for the Advancement of Science (AAAS)) 266 (16): 4,988–4992. doi:10.1126/science.7992059. http://www.sciencemag.org/cgi/reprint/266/5191/1726.pdf. cited in Whitten, T; Soeriaatmadja, R. E. and Suraya A. A. (1996). The Ecology of Java and Bali. Hong Kong: Periplus Editions Ltd. p. 309. ↑ Peter Lewis (1982). "The next great empire". Futures 14 (1): 47–61. https://dx.doi.org/10.1016/0016-3287(82)90071-4. ↑ Charles Bidien (5 December 1945). "Independence the Issue". Far Eastern Survey 14 (24): 345–348. http://links.jstor.org/sici?sici=0362-8949%2819451205%2914%3A24%3C345%3AITI%3E2.0.CO%3B2-S. ; "Indonesian War of Independence"". Military. GlobalSecurity.org. Retrieved 2006-12-11. ↑ Vickers, Adrian (2005). A History of Modern Indonesia. Cambridge University Press. ISBN 0-521-54262-6. ; Schwarz, A. (1994). A Nation in Waiting: Indonesia in the 1990s. Westview Press. ISBN 1-86373-635-2. ; Ricklefs, M. C. (1991). A History of Modern Indonesia since c.1300, Second Edition. MacMillan. ISBN 0-333-57689-X Check |isbn= value: checksum (help). ↑ Jonathan Pincus and Rizal Ramli (1998). "Indonesia: from showcase to basket case". Cambridge Journal of Economics 22 (6): 723–734. doi:10.1093/cje/22.6.723. http://cje.oxfordjournals.org/cgi/content/abstract/22/6/723. ↑ "President Suharto resigns". BBC. 21 May 1998. Retrieved 2006-11-12. ↑ Burr, W.; Evans, M.L. (6 December 2001). "Ford and Kissinger Gave Green Light to Indonesia's Invasion of East Timor, 1975: New Documents Detail Conversations with Suharto". National Security Archive Electronic Briefing Book No. 62. National Security Archive, The George Washington University, Washington, DC. Retrieved 2006-09-17. ; "International Religious Freedom Report". Bureau of Democracy, Human Rights, and Labor. U.S. Department of State. 2002-10-17. Retrieved 2006-09-29. ↑ Robert W. Hefner (2000). "Religious Ironies in East Timor". Religion in the News 3 (1). http://www.trincoll.edu/depts/csrpl/RINVol3No1/east_timor.htm. Retrieved 2006-12-12. ↑ "Aceh rebels sign peace agreement". BBC. 15 August 2005. Retrieved 2006-12-12. This page was last changed on 31 March 2019, at 08:19.